Amatrol’s Electrical Fabrication 1 Learning System (96-ELF1) teaches the fundamental concepts of electrical wiring, including the industry-standard components used by electricians, technicians, and engineers to install, operate, repair, and design equipment for modern industry. Learners will gain expertise in key skill areas, such as basic electrical system wiring, interpreting wire installation plans, handling non-metallic cable, connecting electrical services, and installing basic electrical components like switches, outlets, and lighting. 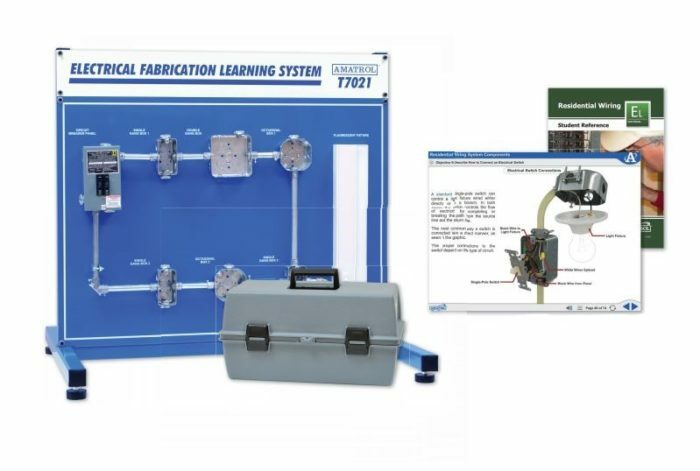 The electrical wiring training system features a desktop workstation, wiring component and consumable packages, a storage case for loose components, and a hand tool package, as well as in-depth, highly-interactive multimedia curriculum. The combination of real-world components and hands-on electrical wiring training allows learners to practice skills they will use on the job, such as: wire stripping and termination techniques, grounding methods used in junction boxes, installing a circuit breaker in a service panel, and many more! Amatrol’s electrical wiring training system features a wide variety of real-world components used by electricians and engineers, such as lineman’s pliers, diagonal cutters, circuit breakers, electrical boxes, toggle switches, and an assortment of wires and cables. Learners will use these components to practice essential skills used in industry, like connecting a plug to an electrical cord, running and securing non-metallic cable between electrical boxes, and connecting a wiring system to a service panel. The electrical wiring training system’s interactive multimedia curriculum provides in-depth coverage of electrical wiring topics, such as: the operation of fuses and circuit breakers, how to connect an electrical switch, how to remove the sheathed jacket from non-metallic cable, how to install a spade-lug connector on a wire, and much more! The curriculum also focuses on safety standards to ensure learners practice installation techniques that are safe and consistent with the National Electrical Code (NEC). Amatrol’s curriculum features a highly-interactive, multimedia format that includes stunning 3D graphics and videos, voiceovers of all text, and interactive quizzes and exercises designed to appeal to learners with different learning styles. The electrical wiring training system curriculum teaches learners about the basics of residential electrical wiring systems. For example, learners will study service connections and how to install switches, outlets, and lighting. The combination of theoretical knowledge and hands-on skills solidifies understanding and creates a strong basis for pursuing more advanced skills. A sample copy of the Residential Wiring Student Reference Guide is also included with the system for your evaluation. Sourced from the system’s curriculum, the Student Reference Guide takes the entire series’ technical content contained in the learning objectives and combines them into one perfectly-bound book. Student Reference Guides supplement this course by providing a condensed, inexpensive reference tool that learners will find invaluable once they finish their training, making it the perfect course takeaway.